The latest East Midlands Derby finished in stalemate last night as Derby and Forest fought out a 0-0 draw. This is the second time in succession that no goals has been scored in the clash of the East Midlands two biggest names. Derby were the better side for much of the first half and Forest moved up a gear in the second. I think that a draw was probably the right result with neither side doing enough to deserve the win and neither deserving to lose. Derby had what looked a definite penalty turned down when Lawrence was felled in the box, but Jayden Bogle can count himself a very lucky boy not to receive a red card too. There was also claims that Tomori himself could have been looking at a red later on as well. The thing is had one of those decisions been made, then the who pattern of the game changes. Are you in our Rams fans gallery? Had Derby scored from a penalty then you would possibly have seen a different game afterwards and same with the calls for the two red cards. These clashes are always fought hard and no player fit to wear either shirt will give an inch! As a scoreless draw it wasn’t a bad game! You’ll see far more worse games before the season is out. What was noticeable that overall that Harry Wilson, Mason Mount and Jack Marriott were foiled by the opposite numbers. Likewise Carvalho, Lolley and Grabban were restricted by the Rams. Both clubs are looking for a serious promotion challenge and on the evidence from last night they could both easily be top six but just as easily miss out in this fiercely contested, crazy division. The key is turning defeats into draws and draws into wins. Now I am one of those who would love to see both clubs plus another from the Midlands and up the Central England representation in the Premier League. Yes! I always want to beat them, but looking at the bigger picture its obvious to see that the region would be benefitted by top flight football in both cities. We host Bristol City on Saturday and this season they haven’t quite got up to their standards of last season. I think we must grab the opportunity to get ourselves back in synch and treat the fans to an early Christmas present of three points and a good overall display. Maybe time to get Martyn Waghorn on the pitch from the kick off too. He adds energy out wide and many fans are scratching their heads as to why he hasn’t had any game time recently. 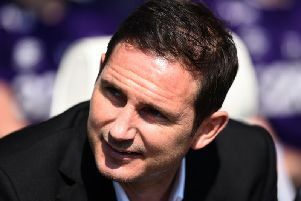 Only Frank Lampard knows the reason for that, but we, at the end of the day will have to trust the boss. He’s had a good first half to the season and hopefully we can soldier on through a succession of tough looking fixtures over the holiday period.